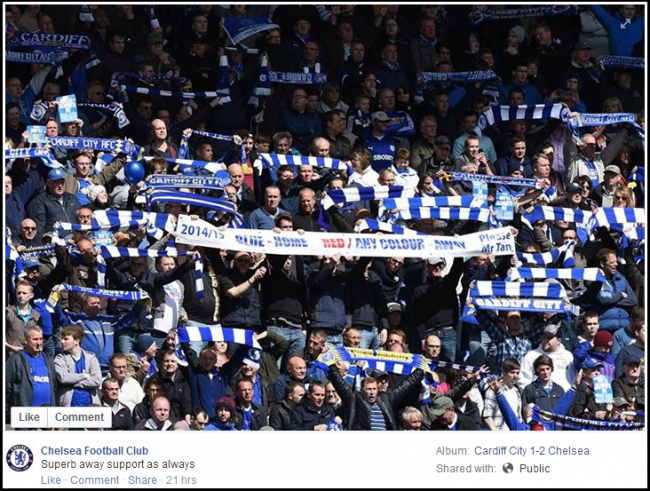 Chelsea posted the following photo to their Facebook page yesterday in order thank the club’s travelling fans for their “superb away support as always” throughout their final game of the season against Cardiff City on Sunday. Yep. The punchlines write themselves. Is that the Everton fans? Why is this not listed as a “Fail”, Pies? You afraid of Chelsea’s knuckle dragging neanderthals or something? @Geraldo: Oh, but it is my boy. The categories are just listed in alphabetical order so “Cardiff City” shows up on the homepage. Hahahah … plastic club is plastic. To be fair we’re all Chelsea fans, maybe you just haven’t realized it yet. It’s the guy in the top left corner of the picture not able to tell the difference between a Cardiff and a Chelsea scarf. I can see quite a few scarves with the words “Cardiff City” on them!!!!! Craig, as you can see by the album name posted in the picture the game is Cardiff 1 – Chelsea 2, as in: the result of last Sunday. With Chelsea correctly listed as the away team. They played Cardiff a few days ago at home, if by a few you, mean 207 days. Craig, cfc have been making humans look like cunts for years (apart from John Terry, he needs no help whatsoever).